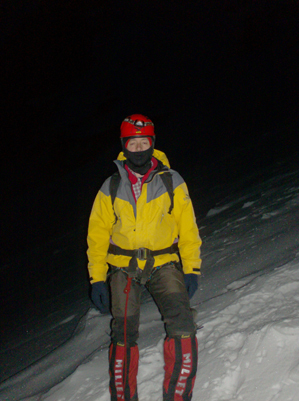 The effects of altitude are a significant issue when climbing in high mountain. How you acclimatize and cope with altitude is strongly determined by genetics, so it ‘s an area where age and fitness often makes little difference. For this reason it ‘s important to follow a sensible acclimatisation plan. First off, a few words of advice here – if you are going to climb Mont Blanc in just one weeks holiday – then who ever you book with, we recommend you always go for a six day itinerary as a minimum. You simply won’t be acclimatised properly for Mont Blanc after just a couple of days climbing off cable cars and sleeping in the valley, or spending a single night up in a hut (we know there are companies out there offering 5 day itineraries and we could easily offer the same ourselves – but we don’t run them, because they aren’t in the best interests of our customers). A good acclimatisation program follows a staged approach – for Mont Blanc we spend 2 night s sleeping at altitude in a mountain hut, climbing first to 3600m and then to 4000m over a period of three days – this allows your body time to adapt properly to the reduced oxygen content of the air. Reaching 4000 m prior to the ascent of Mont Blanc makes a big difference on summit day – greatly increasing both your enjoyment of the climb and chances of reaching the summit. The more acclimatisation you do the better – so if possible, we recommend you arrive a few days early in order to spend some time at altitude prior to starting the week.